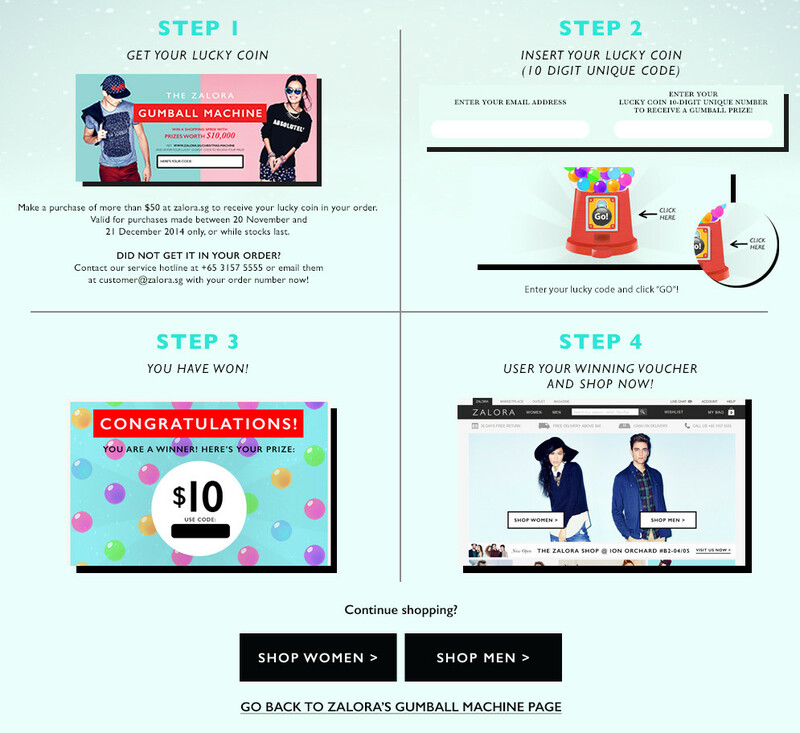 The Promotion is open only to official ZALORA Gumball Machine lucky coin (a unique 10-digit code) holder. Entrants under the age of thirteen (13) years old must seek parental and/or guardian consent before participating in the Contest. The Promotion is valid from 18 November 2014 to 31 December 2014, or while stocks last, only at www.zalora.sg. Customers are entitled to 1 ZALORA Gumball Machine lucky coin when they make a purchase of above $50 at www.zalora.sg, or via ZALORA SG Facebook and promotions from our external partners. All prizes must be redeemed by 31 January 2015, 23:59:59. Failure to do so will result in the forfeit of prizes. Jade E-Services Pte. Ltd. reserves the right to disqualify all winners that do not meet the rules and regulations of the ZALORA Gumball Machine Promotion. These include hacking, code mining or any other means of interference or attempt to interfere with the Platform, or any activities on the Platform. You agree not to obtain or attempt to obtain any materials or information through any means not intentionally made available through the platform. You agree neither to modify the platform in any manner or form, nor to use modified versions of the platform, including, without limitation, for the purpose of obtaining unauthorized access to the platform. You also agree that you will not use any robot, spider, scraper or any other automated means to access the platform for any purpose. Failure to comply will result in the forfeit of prizes. Prizes are non-transferable and non-exchangeable for cash. Value of the prizes may vary; Jade E-Services Singapore Pte. Ltd. reserves the right to replace any prizes with items of similar value without prior notice. Jade E-Services Singapore Pte. Ltd reserves the right to terminate, amend or extend this promotion in the event of exceptional circumstances outside its control which affect its ability to operate the promotion. Acceptance of any prize shall constitute consent on the winner's part to allow the use of the winner's name, image, voice and/or likeness by Jade E-Services Singapore Pte. Ltd for editorial, advertising, promotional, marketing and/or other purposes without further compensation except where prohibited by law. Acceptance of any prize shall constitute a release and discharge of Jade E-Services Singapore Pte. Ltd. by each winner from any and all liability, claims, demands, causes of action, and/or damages which the winner may have, whether known or unknown at the present time, of any nature whatsoever, arising out of or relating to: (i) the contest, (ii) personal injury and/or property damage, theft or loss suffered by the winner as a result of the use and/or enjoyment of the prize, and/or (iii) any tax liabilities in relation to the contest, prize and/or use or enjoyment of the same. The Grand Winner of the contest may be announced on www.zalora.sg or official social media pages. The Grand winner will also be notified separately by email or telephone and will be required to acknowledge by return email latest by 31 January 2015. Jade E-Services Singapore Pte. Ltd. reserves the right to deal with all unclaimed prizes in any manner deemed fit. Subject to the terms and conditions herein, there will be only one grand winner. The grand winner shall receive one (1) $1,000 ZALORA Gift Voucher. Winner must produce proof of identity and the physical or print out of the ZALORA Gumball Machine Lucky Coin upon the prize collection at Jade E-Services Singapore Pte. Ltd.’s office currently located at 180 Clemenceau Avenue, Haw Par Centre, #06-02, Singapore 239922 (as of 18 November 2014). Grand prize not collected by 31 January 2015 shall be disposed of at Jade E-Service Pte. Ltd’s sole discretion. Jade E-Services Singapore Pte. Ltd.’s decision regarding the award of all prizes, and/or in every situation including any not covered in these Terms and Conditions, shall be final and binding on all participants in the contest, and no queries, challenges or appeals may be made or entertained regarding Jade E-Services Singapore Pte. Ltd’s decision on the same. The receipt by any winner of any prize under this Contest is conditional upon compliance with any and all applicable laws, rules and regulations. All other prizes must be redeemed by 31 January 2015, or they will be forfeited.